The Islamic Jihad terror organization announced earlier this afternoon (in a report quoted by Haaretz, as well as by Reuters) that one of its terrorists was killed on what it termed a “Jihadist mission” today – in other words, an attack aimed at Israelis. Islamic Jihad has been behind many of the rocket attacks that have targeted civilians in southern Israel from launching points in the Hamas-run Gaza Strip. 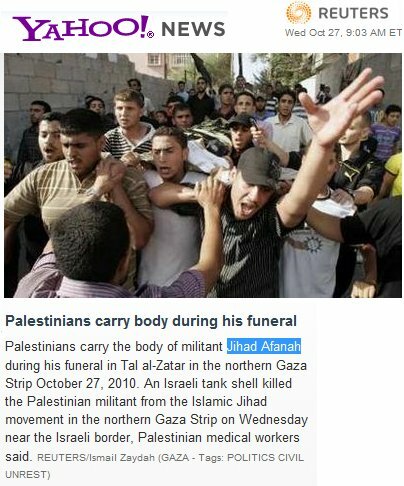 Ynet, quoting Gaza Palestinian sources, says the dead man was 20, and a member of Islamic Jihad’s so-called military wing al-Quds Brigades (as if a terrorist organization has wings that are not inherently terrorist). The IDF’s spokesperson confirmed the basic facts: one of its tanks fired on “two Palestinian suspects who approached the security fence” and the target was hit. 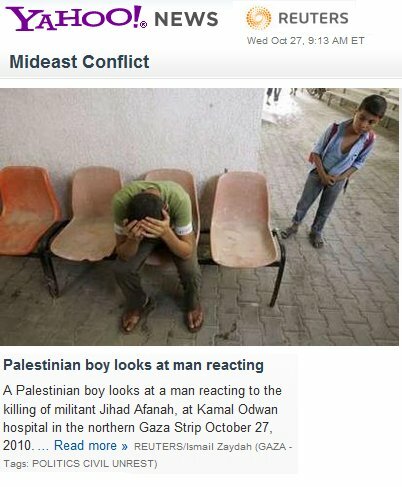 Palestinian Arab medical sources in Gaza, also quoted by Haaretz, said a second person nearby was wounded. As happens so often, this is only part of the story. Earlier today a mortar shell fired into Israel from the Gaza Strip exploded in an open area near one of the kibbutzim of Shaar Hanegev. Fortunately, no one was hurt and there was no damage, but this was not the intention of the jihadists. And unlike the death of the terrorist, the mortar attack is entirely unreported at this hour, outside of Israeli news channels. 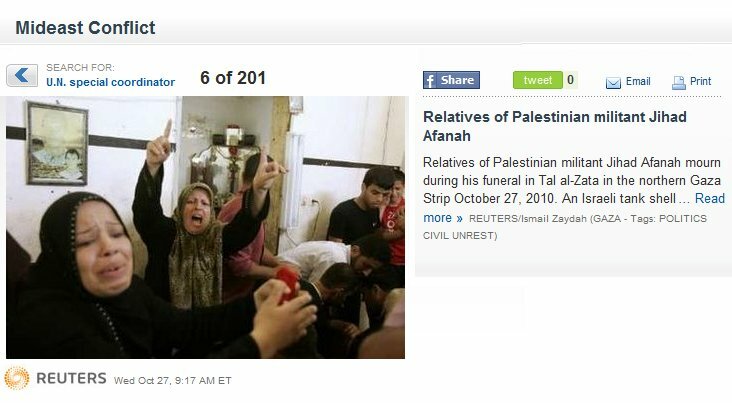 Meanwhile, true to form, the major news agencies are already promoting the traditional photos(see below) of wailing, inconsolable friends and relatives… of the dead terrorist for heaven’s sake. His name happens, perhaps not by chance, to be Jihad Afanah. The narrative by which the jihadists and the Islamists are perpetual victims is, somehow, irresistible to the photo editors who, sad to say, know their customers well. Here, below, are several of the agency photos already making their way around the world into the syndication channel. To us, the tone of sympathy and tragedy they sound is a disgrace. Not a new disgrace, but a disgrace. Either the editors at AP and Reuters believe the dead man is a terrorist, in which case why do they time and again frame the death by reference to bereavement and loss? Or they actually believe this dead man and his ilk are activists – and in that case their message seems to be: how very sad that a sincere young man died while trying to achieve his noble goal. Either way, the syndicated publication of pictures like these brings no credit to the editors or the agencies. I have never been able to understand why there is so much carrying on by relatives and friends when a person who says he wants to die in a Jihad gets his wish. As for that last photo (the Yahoo one), could it be any more staged?! The only thing spoiling the effect is the guy on the left checking his text messages. 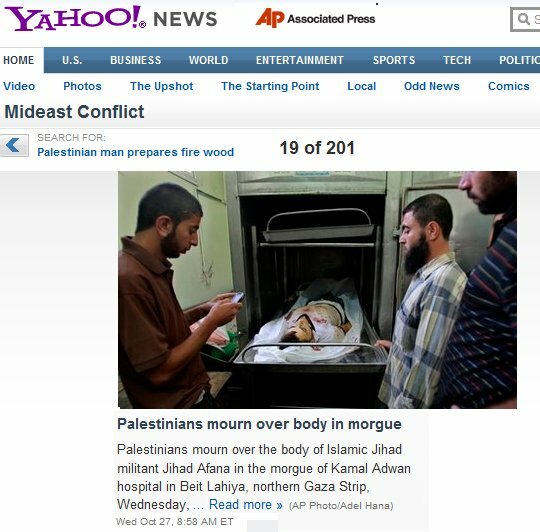 And the other Yahoo photo, the 2nd one, has a problem too. The chap in front (back to camera) with the stripy purple shirt is shouting “stop, stop, stop, I didn’t shout action yet…”. Shades of Pallywood but we are wise to them.